Oh my goodness, I am so excited for Spring and Spring shoe shopping! Don't get me wrong, I love my riding boots, but there's definitely something about bringing out sandals and lightweight tennies that is so refreshing. I could not be more ready to go outside without a coat and snow boots. This year I am thinking about purchasing a pair of plain leather sandals, as well as a bright, fun pair to dress up outfits. Those metallic flip flops are absolutely perfect because they would match with everything, and the pink and blue tribal sandals would be too cute with white jeans. But those seersucker Jack Rogers ;) A must have! 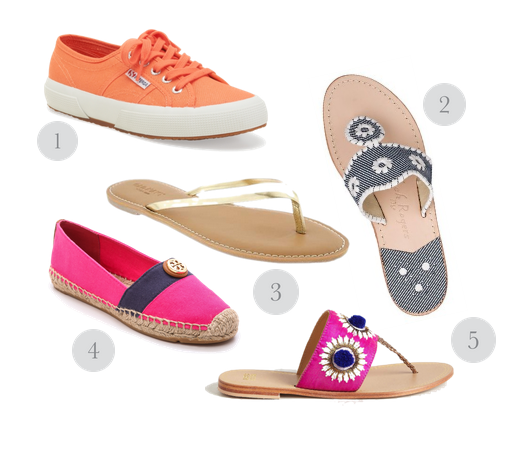 Do you have any cute spring shoes on your radar? Love the sandals in #5!! #s 2 & 4 are on my wish list! Do It Yourself… Flower Crown!